I decided it was time to share my top 10 Makeup Geek eyeshadows with you, since I recently showed you my ever expanding collection. This post will probably be short and to the point, especially since I've written it once and it disappeared! This may change over time as I continue to expand my collection, so you may see an updated version in the future. Here are my current top 10. My Makeup Geek obsession is strong. 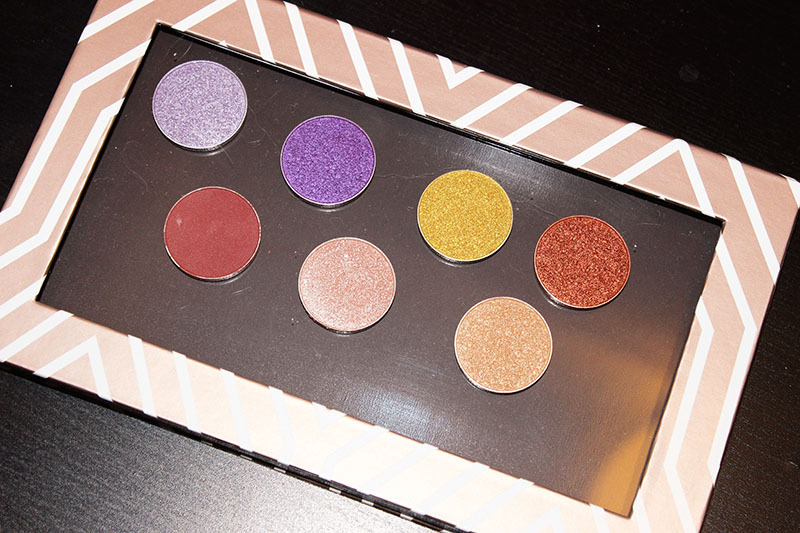 I've bought many eyeshadows from Makeup Geek in the past, but lately I've been on a "hiatus" of sorts. I've been attempting to not buy so much makeup, so the past few releases, I haven't bought anything. A few weeks ago, I went ahead and ordered four shades that I've had my eye on, but there are so many more that I want. The four shades I picked up are Curfew, Venom, Taboo, and Americano. Curfew is described as a matte, medium plum purple. Venom is a deep moss gross with a golden shimmer. Taboo is a matte, ultra deep raisin purple. Americano is a matte, dark brown with subtle purple undertones. I like Makeup Geek's descriptions because they're normally spot on and I totally agree with them. 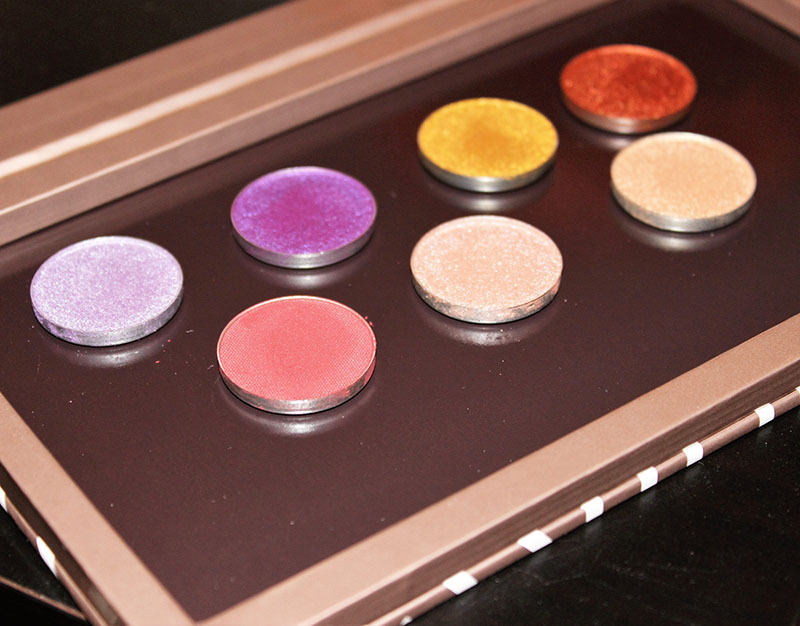 The four shades I grabbed are gorgeous, pigmented and easy to blend. I'm always surprised my Makeup Geek mattes because they're always so soft and blendable. I was slightly concerned when I first swatched them because Americano swatched terribly on my hand, but it applied beautifully with a brush on my eyes. 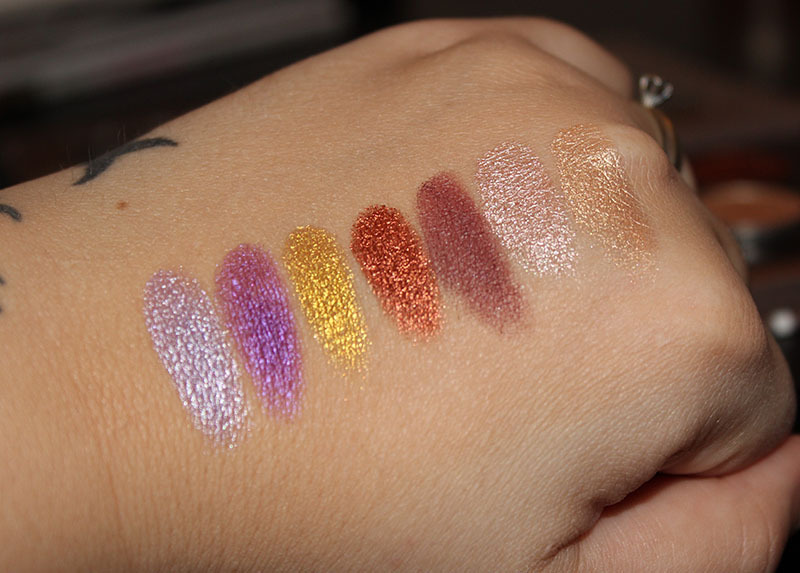 Makeup Geek released duo chrome eyeshadows and pigments a couple of months ago. I don't own all of them, but I own 4 and I wanted to show the swatches because they're so pretty. Secret Garden: Dark warm brown with a green-teal shift. Steampunk: Black base, copper & burgundy shift. Voltage: cream-white base with golden-champagne shift. Phantom: white base with violet shift. The pigment I have is Insomnia. I've used it multiple times and reviewed it in the past. You can find the review of Insomnia here. The duochrome pressed shadows are meant to be less intense and in your face. They're supposed to be more wearable. I love them and I wear them pretty often. I imagine the pigments are probably more intense and 'obvious', I know Insomnia is pretty intense. I want to get a few more of these soon, because I really do love them. If you want a more intense effect from the pressed pans, use them over a sticky base such as Too Faced Glitter Glue. Otherwise, apply them like any other shadow! 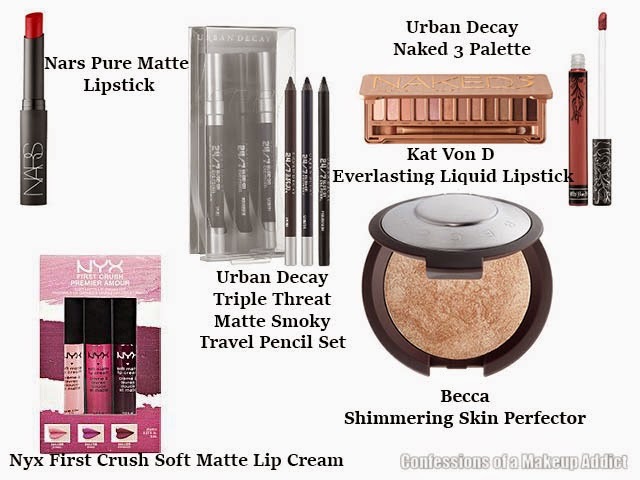 They have the same great formula as the other MUG shadows and are well worth the money. You can find the duochrome collection here. The pans are $6.00 and the pigments are $12.00 each. Here's a few looks I did with these from my Instagram. 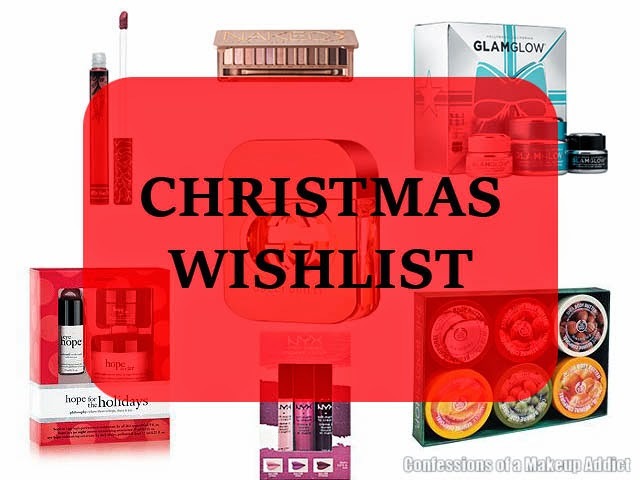 Make sure you follow me so you never miss my FOTD posts! 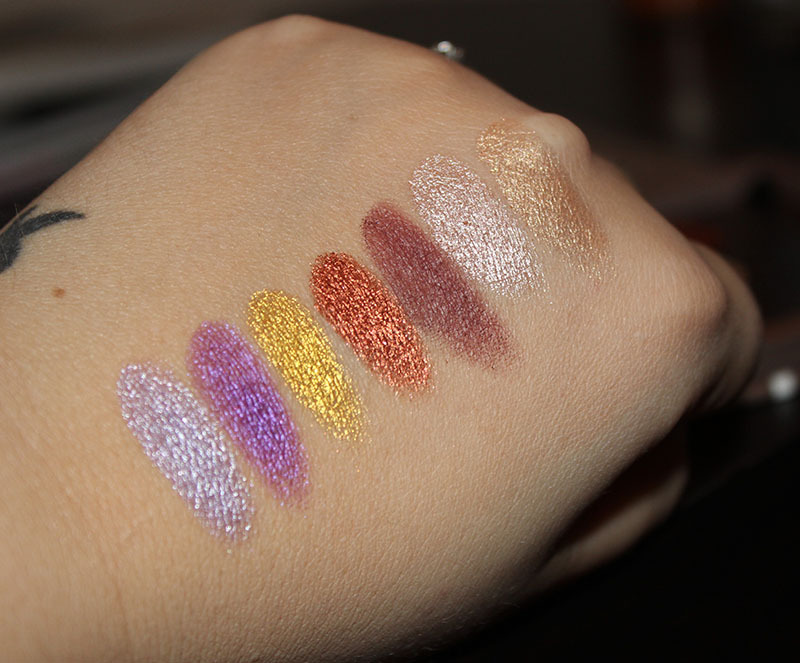 I finally picked up more of the Makeup Geek Foiled eyeshadows. I've been putting it off because I needed another Z Palette to hold them, so I got that too. Before we get into the foiled shadows, let's take a second to appreciate how gorgeous this Z Palette is. I'm pretty sure it's a Makeup Geek exclusive. There's no way I could pass up that Rose Gold Chevron print. No way. You may have noticed that one of these shadows is not, in fact a foiled shadow. That's 'Bitten'. Since I bought it, I figured I'd go ahead and swatch it too. How gorgeous and metallic are these shadows? Seriously. Okay, let's swatch! Whimsical - This is a very metallic lavender/lilac shade. Masquerade - Very violet, slightly blue-toned as you can tell. Fortune Teller - Yellow-gold gorgeousness. Flamethrower - All the coppery goodness you need during the fall. Bitten - Matte burgundy/brown. Not foiled, still a fall necessity. Starry Eyed - Champagne, kind of the color family of Urban Decay 'Sin' but SO much more pigmented, metallic and gorgeous. Slightly more beige than Stila 'Kitten'. Magic Act - Pale gold. Perfect for the holidays. YES. Can you just appreciate how gorgeous these eyeshadows are? I just keep buying them because they're so pretty, I need to own them all. These are almost a cream. 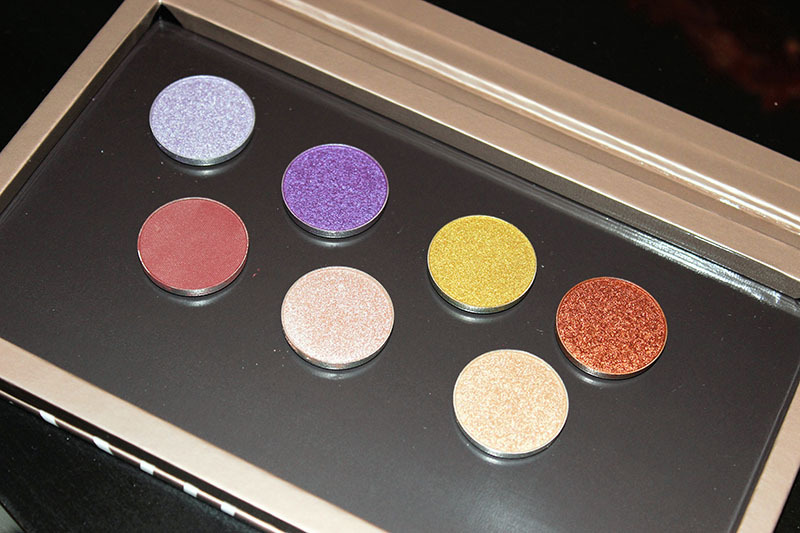 They have more oil in them than normal eyeshadows, which is what gives them their intense pigment and shine. Because of this, an eye primer is a necessity. Without a primer, these are going to crease and quickly. However, with a primer these are amazing. They last all day, they don't fade and that shine is insane. They transfer. If you have hooded eyelids, even slightly like me, they will transfer into your crease almost immediately. Applying eyeliner can be tricky. These are so metallic, shiny and pigmented, that they kind of shine right through your eyeliner. You'll need to layer a liquid liner to get a flat black line, or use an opaque gel liner. These are seriously beautiful shadows and I definitely recommend picking a few up. They're so gorgeous, I just can't pass them up! 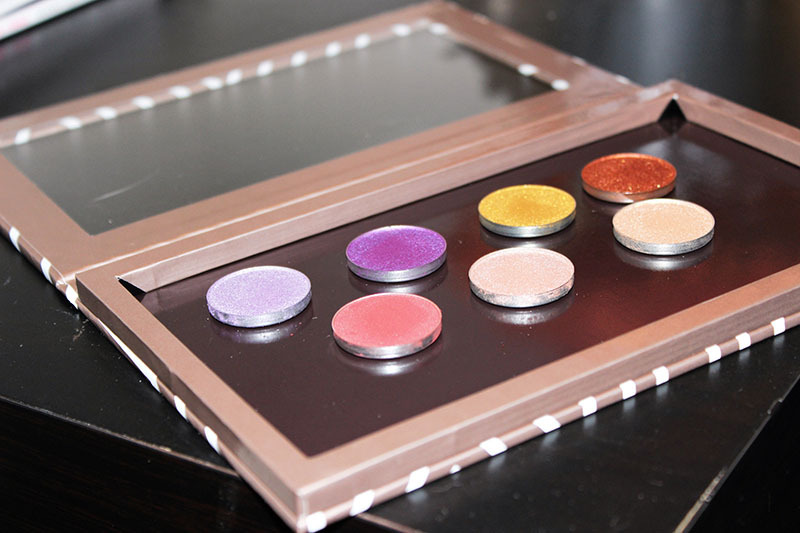 You can grab these at www.makeupgeek.com The foiled shadows retail for $9.99 each. The regular eyeshadows are $5.99 each. Today's post will be a quick one. Since it's Friday, I decided to post a quick FOTD from last weekend. I'll show you the pictures, and I'll list the products I used below!